There’s nothin’ quite like Cajun flavor and we figured it was just about time that somebody brought all that tastiness to a dip. We volunteered for the job, and came up with one creamy, irresistible dip that’s bursting with Cajun flavors. Green onion and a little bit o’ shrimp add a bright and chewy depth to this one-of-a-kind spread. 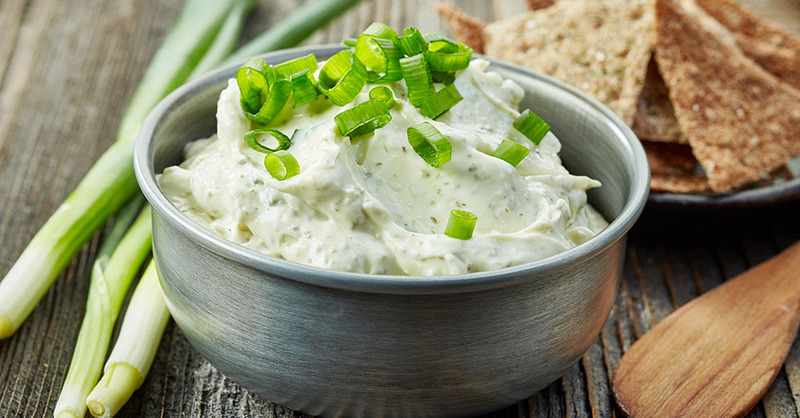 This Cajun-inspired cream cheese and green onion dip provides a yummy complement to chips, crackers or veggies for your next casual get-together. It also makes a great sandwich spread or bagel topper. To create an elegant appetizer, cut toast tips and top with a dollop of the dip and a thin slice of cucumber. You can add a hint of Tabasco sauce if you like a touch more spice, or adjust the level of the Cajun seasoning to suit your palate. Get dippin’! In a large mixing bowl, beat cream cheese with electric mixer. Add evaporated milk a little at a time, continuing to beat until mixture is smooth. Dice green onions and stir into cream cheese mixture. Cut precooked shrimp into 1/4-inch pieces, and add to cream cheese mixture. Season cream cheese mixture with garlic powder and Cajun seasoning. Add Tabasco sauce to taste. Refrigerate until cool, about 1-2 hours, or until ready to serve. Garnish with additional green onions and enjoy!